CHICAGO HEIGHTS—(ENEWSPF)—August 15, 2017. 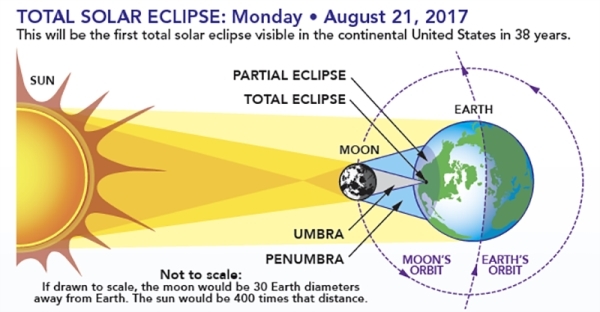 Prairie State College (PSC) is hosting a Total Solar Eclipse 2017 viewing event on Monday, Aug. 21, from 11 a.m. to 2 p.m. The eclipse is predicted to be at its maximum coverage in the Chicagoland area at 1:20 p.m. Participants will have the opportunity to view the eclipse through Cassegrain telescopes, solar glasses and other material to allow for safe viewing. The event will be held outside near the college’s butterfly garden on the main campus, located at 202 S. Halsted St. in Chicago Heights. According to NASA, a total eclipse will cross the entire country, coast-to-coast, for the first time since 1918. The PSC Library has teamed up with the Physics and Astronomy department to offer a once-in-a-lifetime learning experience for attendees. Physics and Astronomy instructors Professor Mohammad Salami and Associate Professor Angela Hung will assist students and provide insight about this rare occurrence. This event is free and open to the public. When viewing the eclipse, observers must use eye protection at all times. For more information about this event, contact Interim Associate Dean Carolyn Ciesla at 708-709-2949. To learn more about the total solar eclipse, visit www.eclipse2017.nasa.gov.